We are two designers who enjoy making simple things and making things simple. Tom Gerhardt and Dan Provost founded Studio Neat in 2010 and have released two minimal products into the market. 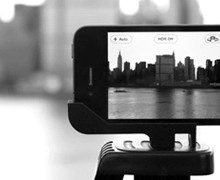 The Glif is a tripod mount for the iPhone and the Cosmonaut is a wide-grip stylus for touch screens. At the CreativeMornings NYC’s December meetup, Dan shared his company’s process, one that the founders say would not have been possible a few years ago. Their website says, “The Glif represents a new way of approaching consumer products, and it wouldn’t have been possible without a few thousand people who believed in us.” Until recently, it was difficult for small companies to manufacture products as bigger companies had more access to resources, but Kickstarter has changed everything. Studio Neat believed in their product and started a Kickstarter campaign to raise $10,000. On November 2, 2011, the funding closed with more than 5,000 people giving a total of $137,417—more than 13 times what the two had hoped for. Kickstarter is not the only resource Studio Neat uses to make their products happen. They order physical prototypes of their designs from Shapeways, an online 3d printing service. They use Shopify for their online store, and Shipwire for product fulfillment. What once may have taken a team of designers, investors, administrators, and logistics people is now possible through crowd funding, hard work, and a few online tools. We think that’s neat.